It's a bird! It's a plane! It's the sequel to Scribblenauts. If you thought 5th Cell was going to be lame and call the previously revealed Scribblenauts sequel Scribblenauts 2, think again. Then think a third time, because 5th Cell is taking a page from the Super Nintendo era with the sequel's name. Officially announced today was not Scribblenauts 2, but Super Scribblenauts for the Nintendo DS. This seems like something a developer would name a game in the 1990s, but maybe 5th Cell is saving Scribblenauts 2 for a larger evolution of the series, or just thought it was boring to add a pesky number. Scribblenauts was originally released on the DS in September 2009. The game's primary mechanic allowed players to write any noun they wished - such as boat, ladder, and even God - to have it appear in game to aid in the collection of a piece of "Starite" on each level. 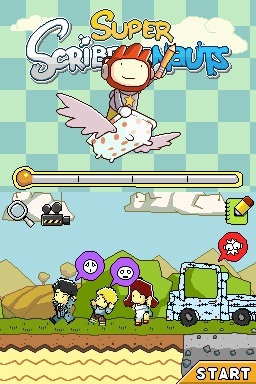 What makes Super Scribblenauts so amazingly super, and perhaps even duper? New levels, upgraded controls, and from the newly released screens the graphics look cleaner too. One huge addition are adjectives which can modify the written nouns. 5th Cell expanded on adjectives and what they can do, saying they will be able to change the color, size, style, and behaviors of objects. They can also be strung together, with some examples given being "flying zombies" and "purple, obese, winged elephants." I might buy the game just to make those zombies bite those elephants, and then have my own zombie elephant army to rule the world with. I mean, to collect Starite with. Super Scribblenauts is scheduled for fall 2010.